A mom trying to get fit…but LIFE always has it’s own agenda. Ever since my half marathon in October its’ been like a 5k run ever two weeks. 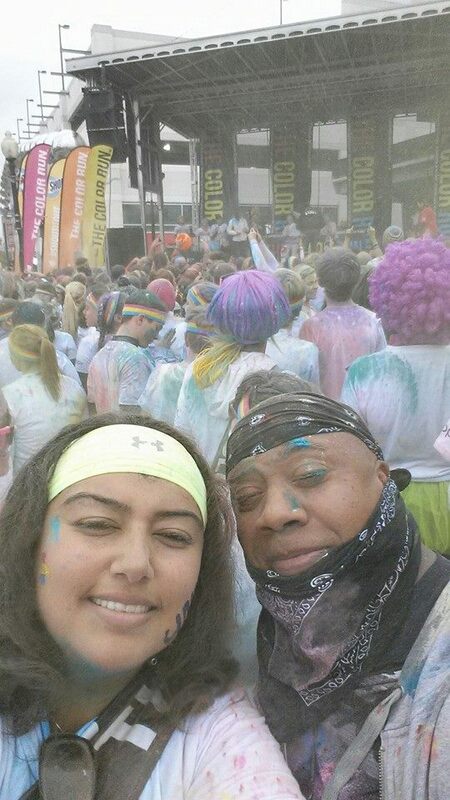 Larry and I did The Color Run at Nationals Park in DC 2 weeks after running our 13.1, then another 2 weeks later–I attended the Montgomery County “Girls On The Run” 5k with my daughter. Out of the 3 runs this was the most rewarding as a parent, it was my daughters first 5k and she did her run/walk pace. I was so proud of her to keep motivated in picking goal points along the way of when to start running and walking. I told her about the tag-it lady I met during my 13.1, that we implied it with friends and tagged them as we passed them and slowed down to catch our breaths after tagging them. It was totally so much fun and she’s looking forward to her mommy’s promise. 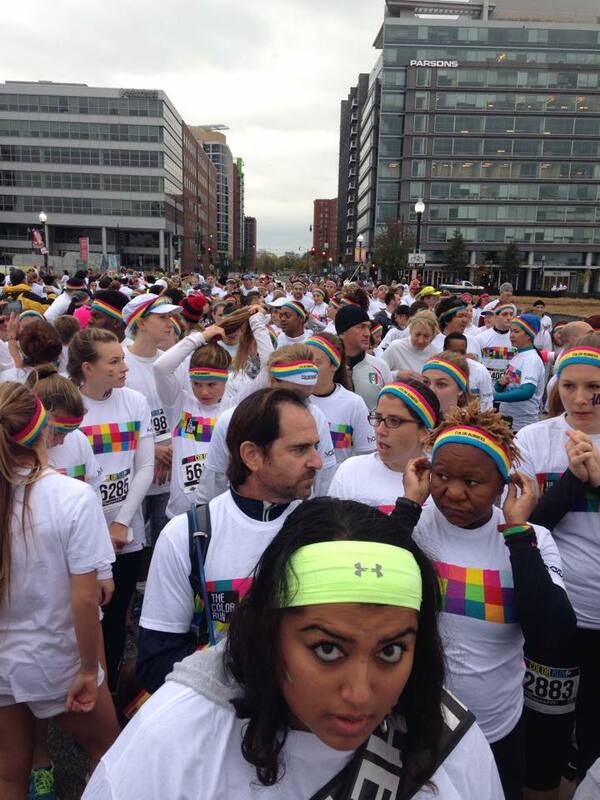 The promise was that after her first 5k, I will register her for “The Color Run” with me the next time I do it. 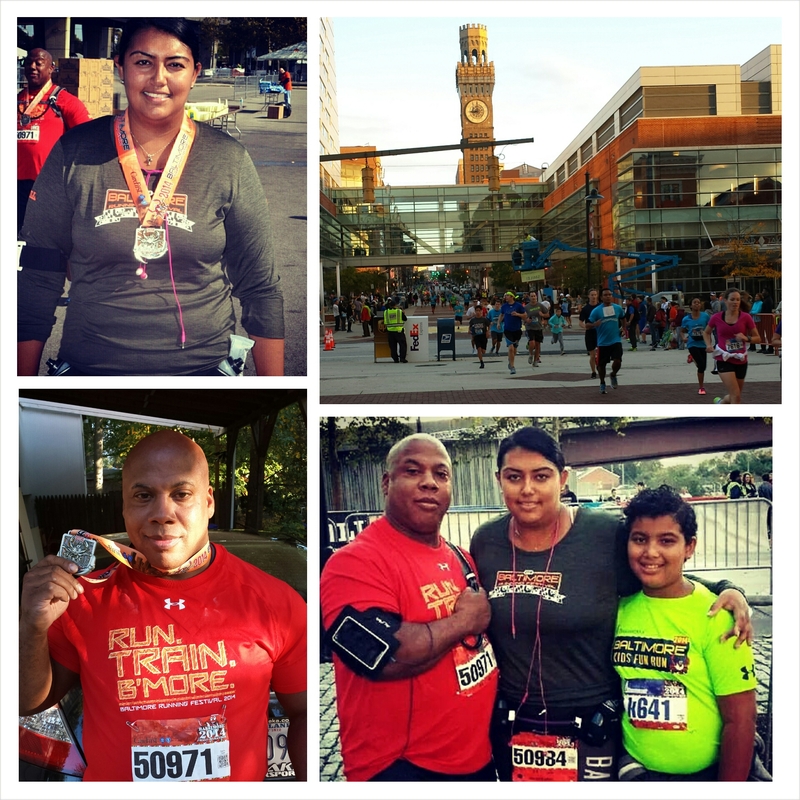 It has been a little over two weeks since my second half marathon I participated on October 18th. 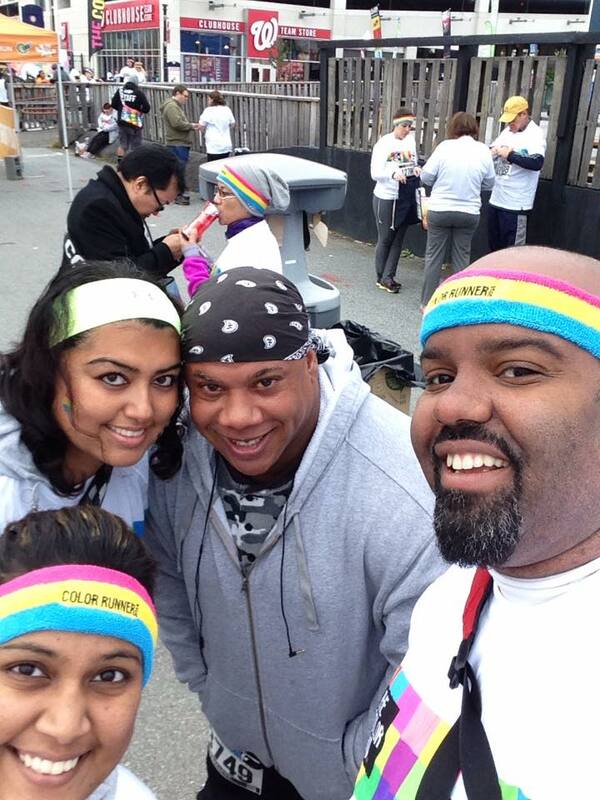 However, this past Saturday I attended my first fun run, The Color Run which of course is the #Happiest5k on earth!! Two thumbs up for its location being at #NationalsPark in DC, and I got Larry to tag along. While we met up with some old friends at the event, we got lucky it didn’t rain till later in the day. The runners were fun, friendly, and ecstatic…my kind of people 🙂 I can’t wait to do it again and bring my 9 year old daughter to experience it too! Check out my awesome pictures and video capturing this wonderful event. Run as a team, I leave no one behind! We did it!! Yes this was the song I started to sing to Larry with one mile left to complete our first half marathon as a couple–it was totally worth the experience together. You think you start off planning everything accordingly, but with all the excitement of my daughter doing her first Kids Fun Run at the 2014 Baltimore Running Festival this past Saturday. Well, you get carried away with the run arounds and what not. This led to Larry and I being real late to the start line of our half marathon. I wouldn’t be able to tell you how late because for the second time in a row, I fail to wear a watch to a half marathon. We were so late that we couldn’t tell where our start line was that we almost ran the full marathon course, but we figured it out and we were on our way. I don’t know how we got through the first 3 miles but I can tell you this we never walked and ran (shuffled, lol) so fast. Luckily Larry’s hamstring was just warming up but still he had issues with it through the run. The few spectators that were left or about to leave with their “Run like Zombies are chasing you” sign, by the 3rd mile mark were awesome. Still cheered us on and even a group had their own unofficial table with snacks for runners. We were about 100ft from meeting with the full marathon course at the 3rd mile when the marathon officials were following slowly behind us with their car because they were getting ready to open the roads behind us. BUT WE MADE IT and we continued the course with the rest of the runners. From that point on it was quite an experience, I had so much fun running with Larry then alone when I did it the first time 2 years ago. You have someone to talk to, laugh with and fart with LOL (thanks snack station at 7.5 mile (20.5mile-Full) with Salt & Vinegar chips), just saying it happens when you run these things–what can I say. <shrugs> Runners around us would sometimes come up and make comments. One woman came by saying: “Can I ask you a question?” We: “Sure!” Woman: “Why did we sign up for this again?!”. Another runner mentioned: “YOU LIED ABOUT ALL THESE HILLS!”. But really I have to give a shout out to the best two groups of spectators with their unofficial water stations. Around 7th mile (20mile-Full), shout out to the table with wine shots for runners! And a shout out to the 10th mile (23rdmile-Full) with a their unofficial water table of beer shots! They were both refreshing. While Larry and I were not doing it for time but for completion, I have to say I am so proud of him for training with me and going through with it. It was the best thing we have done together and I can definitely see that we are an awesome team. Here’s to many more runs with him as our next one is The Color Run in DC on November 1st. Ready to PlowON and RunHON! Then the last 2 weeks of training were easier runs which went so fast that the next thing I knew, I got our E-Cards to pick up bibs at the Baltimore Running Festival EXPO at the Baltimore Harbor. These EXPOs are like kids in a candy store….literally….see…. Love PlowOn Gum. AND them BAM! We got our official Bibs can’t you tell we are excited for tomorrow!